First, legal secretary Terri Maness is found murdered in her Wichita town house in the summer of 1989. Two weeks later, Joan Butler disappears from her Overland Park apartment. Days later, roommates Christine Rusch and Theresa Brown of Lenexa are reported missing. Without a trace, they were—Suddenly Gone. Panic and fear gripped Wichita and Kansas City as the realization slowly sank in—a serial killer was on the loose. What finally linked the handsome, charismatic Richard Grissom to the murders? What was it about Grissom’s secret past that convince investigators that he was capable of such heinous crimes? In Suddenly Gone, author Dan Mitrione, a former FBI agent, takes readers into one of the most exhaustive manhunts in Kansas history. With exacting precision, Mitrione shows the investigation unfolding, as he uncovers information never before made public. 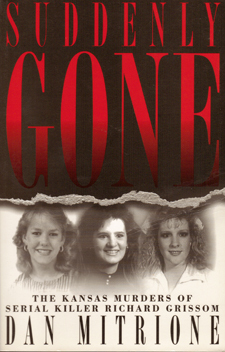 Mitrione’s story is ultimately one of tragedy, but it’s also a story of love and commitment from family, friends, and investigators—all on a mission to find out why four women were Suddenly Gone.